Coffee farms and the recreation economy flourish beneath Panama’s big volcano. 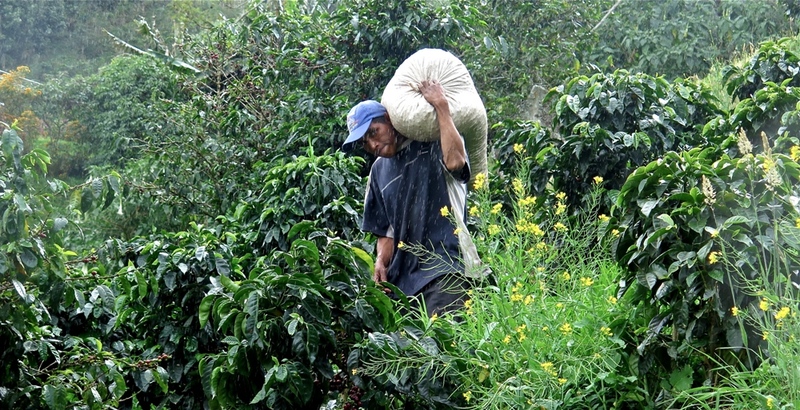 In a light rain, a worker shoulders a sack of harvested beans to be weighed. Click image to enlarge. BOQUETE, Panama — A mile high in the western highlands, near the border of Costa Rica and in the shadow of 3,474-meter (11,398-foot) Volcan Baru, a dormant volcano that is Panama’s tallest peak, lies a convergence of water, sun, soil, and altitude that produces superb coffee. The very same union of God-given natural bounty also yields a prodigious display of beautiful flowers and an afternoon banquet of rainbows that arc, mountain range to mountain range, to form half-halos of color above this handsome valley town. For a generation now, and with the help of a sizable community of ex-pat Americans and Canadians, Boquete (pronounced Bo-ket-ay) has merged its century-old coffee-producing economy with contemporary pursuits like hiking, whitewater rafting, and farm-to-table restaurants. The result is a tourist town set by the fast-flowing Caldera River that resembles Telluride, Colorado, enjoys the sunny weather of Santa Barbara, California, has the authentic and gracious charm of Saint-Malo, France, and the steep and clean wild rivers and challenging cliffs of Banff, British Columbia. Most of Boquete’s 6,300 residents are said to be intent on preserving these assets as the foundation of a sustainable economy that is thriving. This is no small feat in a mountainous, water-rich region that is a study in fluid mechanics and kinetic energy. Rivers are big and move downhill with authority in western Panama, which is attracting intensive hydro-electric power development. A portion of that new definition rests in Boquete. In town there are lovely restaurants like the Art Cafe, which serves exquisite French dinners for a fair price and Punto de Encuentro, where Boquete’s best breakfast is served. Olga, Punto’s owner for 17 years, gives customers a hug and a kiss hello, and a hug and a kiss goodbye. On a slope of Volcan Baru about 300 meters (1,000 feet) above Boquete, is a microclimate that supports about 50 small farms that are competitive internationally for producing some of the world’s best coffee. One of them, the Finca Lerida farm, was founded in 1911 by a German engineer who spent much of his time assisting in the construction of the Panama Canal. Down the road is the famed Hacienda La Esmeralda, owned and managed by the Peterson family, that became a station on the international coffee map with its mild and delicious Geisha variety coffee, the best of which sells for $US 153 a pound — when it can be found. 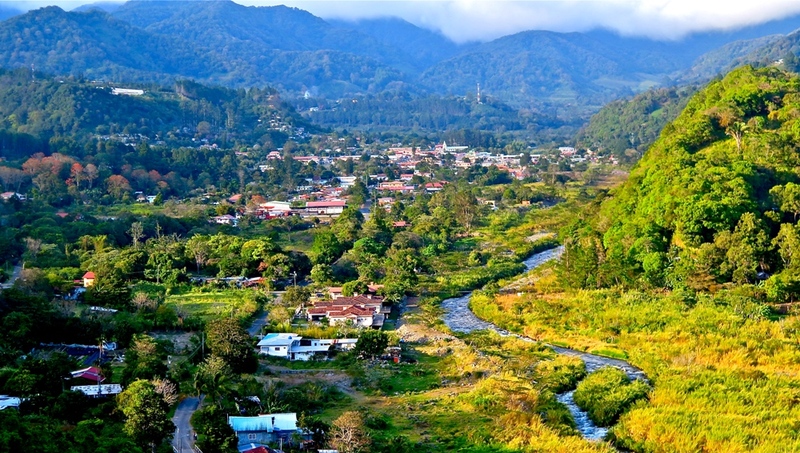 Boquete, Panama, in the mountains close to Costa Rica, is set in a valley below Volcan Baru, the nation’s tallest mountain. Click image to enlarge. With prices like that, Boquete’s coffee farmers aren’t afraid of telling visitors that money really does grow on trees. Coffee trees love this place. The rich volcanic soil, bright sunlight, and afternoon clouds that surround the trees in a moisturizing mist, turns seedlings into mature producing trees in less than four years. The trees yield clusters of red fruit, smaller than cherries, that are sweet when eaten raw. Cesar Caballero, a 28-year-old Boquete native, who leads Finca Lerida farm tours, said it takes 50 permanent workers to care for the orchards, harvest the fruit, dry and process the beans. 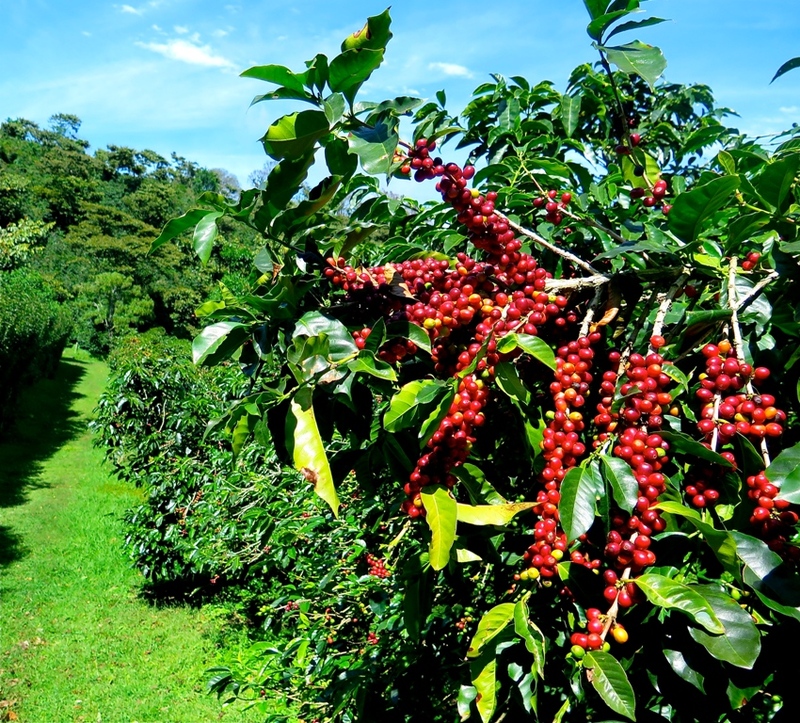 The farm produces 30,000 pounds of its own coffee fruit a year, which yields 10,000 pounds of finished coffee beans ready for sale to the global market at $US 15 a pound. Finca Lerida also dries and processes coffee from other plantations. A portion of the harvest is roasted on the plantation for sale in the coffee shop or to serve guests in the farm’s 23 boutique hotel rooms. Cesar explains all this to a small group of Americans and Panamanians. 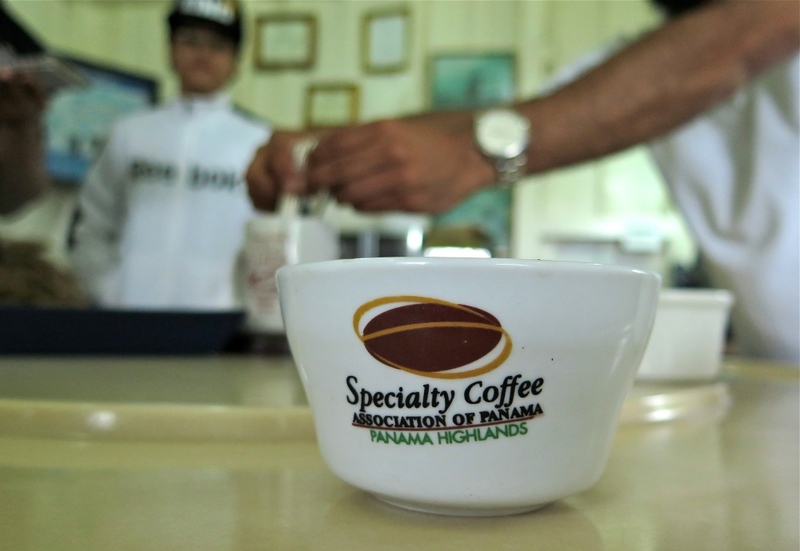 In the farm’s cupping room, where coffees are blended and tasted, Cesar expertly prepared freshly roasted beans, small white cups without handles, and very large silver spoons — the tools for sampling different aromas, and different tastes. He executed these tasks while noting, “I’m not a coffee lover. Coffee isn’t my favorite drink. I really don’t care much for it.” With beans as flavorsome as these, the marketer can afford to stray off message. 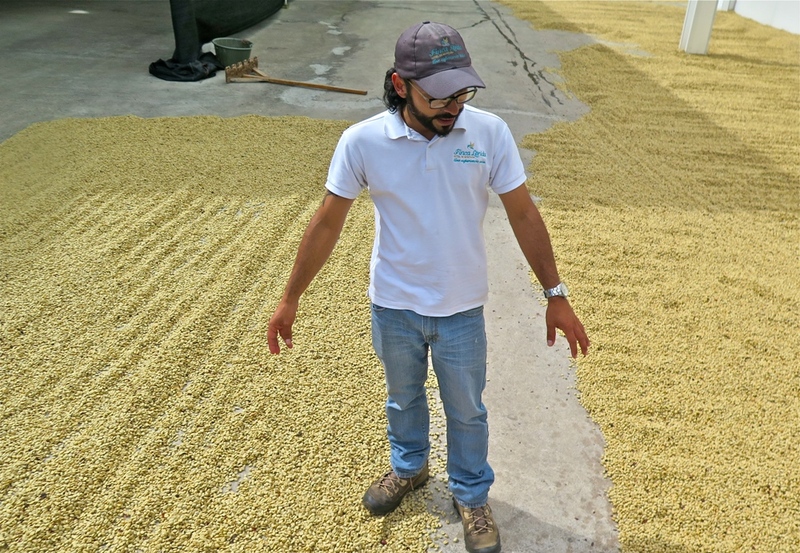 Cesar Caballero, a tour guide at Finca Lerida, explains the art of sun drying coffee. Click image to enlarge. — Keith Schneider, Circle of Blue’s senior editor, is reporting from Panama in January. Read his first dispatch on the country’s challenge in balancing commercial development with ecological protection. Finca Lerida’s ripening coffee. 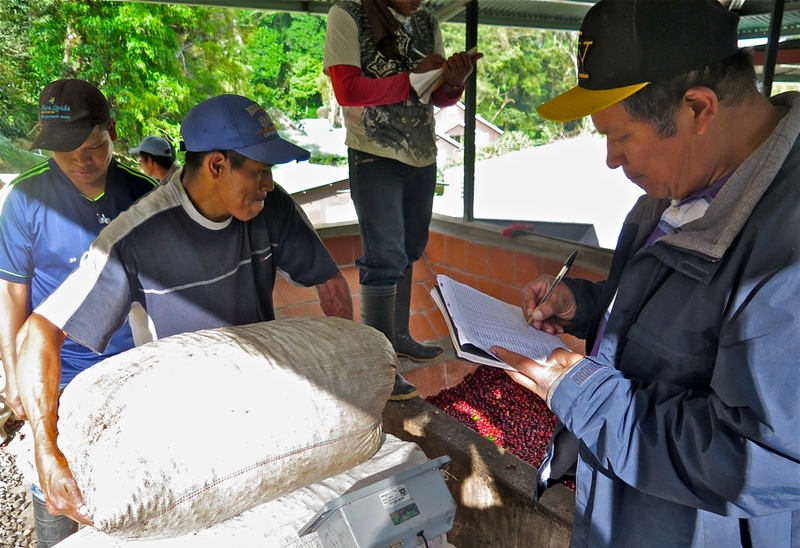 The farm produces 30,000 pounds of raw coffee beans per year. Click image to enlarge. Following a day of picking, Finca Lerida farm workers haul sacks of ripe coffee beans to be weighed and emptied into a crushing bin. Click image to enlarge. 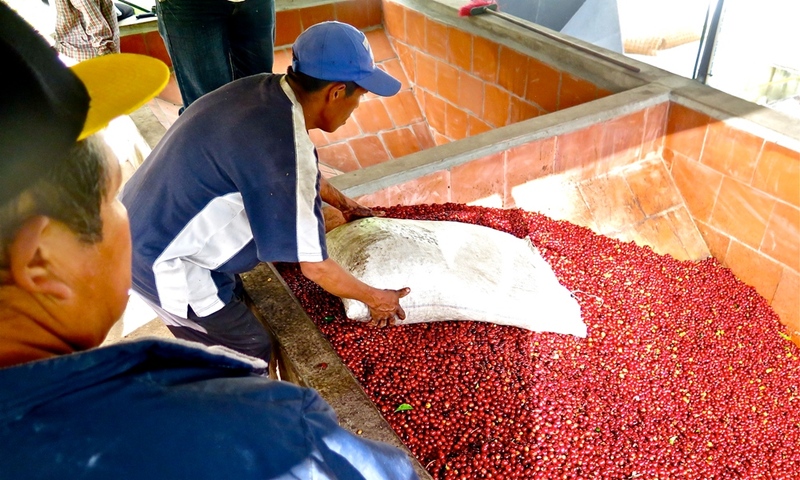 Harvested ripe coffee is loaded into a bin for crushing at the Finca Lerida farm. Click image to enlarge. The cupping room at Finca Lerida, where roasts and brews are sampled. Click image to enlarge.